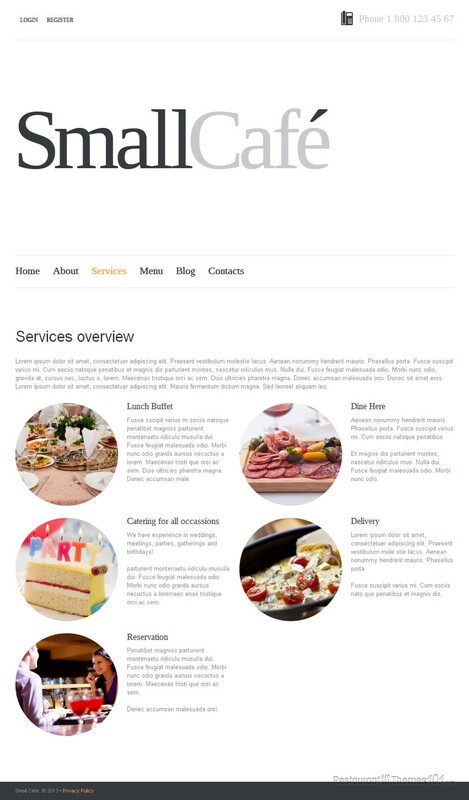 Small Cafe 2 is a responsive Joomla cafe template featured at Template Monster and created by Cowboy. It is very light and pleasant looking which makes it perfect for any restaurant niche, especially coffee shops. 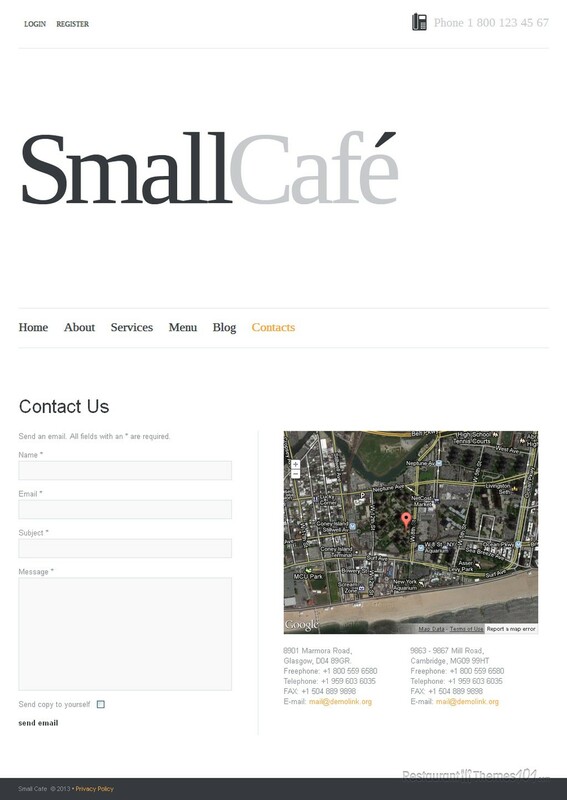 Small Cafe features a fresh, bright layout with a light gray background and white content boxes. 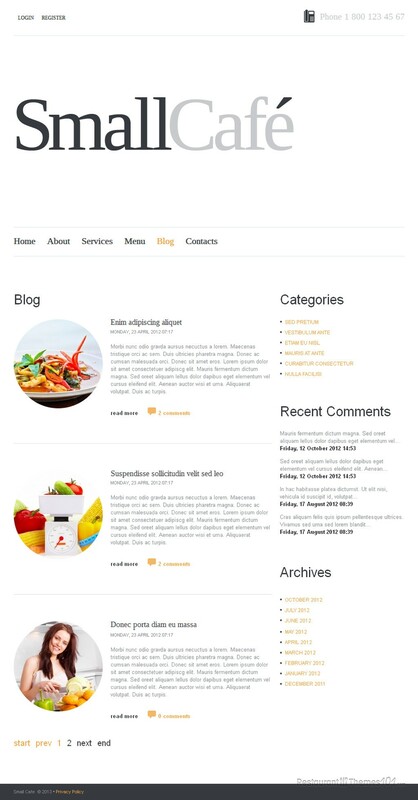 Cute orange details were added, and the whole layout was created to put your content in the spotlight and showcase your delicacies in the best way possible. You will be able to feature many menu items on your homepage, and they will be shown with resized photos, small description text and prices. These photos will be linked to a full content page, and all your visitors have to do is click them, to get to a page where they can read all about the featured delicacy. You can write a nice, detailed “about us” post and introduce your guests to your cafe. Featuring this post on your homepage will be very easy, and your visitors are going to like the fact you want to bring your cafe closer to them. A nice welcoming note can be also added, and this is where you can make your guests feel comfortable and welcomed at your coffee shop. If you want to get more new customers, feature testimonials from the existing ones and show them on your homepage for everyone to see. The menu can be created in 2, 3 and 4 columns, and no matter which you choose, it is going to look very well organized. This responsive coffee shop template for Joomla features a great admin panel, allowing you to run your website all by yourself very easily. It was created on a great framework and it has several important features and extensions added, for creating a professional, fully functional website. There is also a tablet and 2 smartphone layouts of this theme available, so you can rest assure your website is going to look great regardless of the device it is seen from.